Surrounded by picturesque snow-capped mountains, Valdez is arguably one of the most beautiful towns in Alaska and offers some of the most majestic views of mountains you’ll see in any of the Alaskan towns. Valdez is an ideal destination for the wilderness lovers and adventure buffs who visit the town keeping a few days with them to explore the stunning glaciers and the lovely species of fauna complimented by the gorgeous backdrop of the stunning mountain ranges. When you book with Lookupfare, finding cheap flight tickets would be the least of your concerns with our diverse range of offers on online flight booking. Choose from an array of Valdez flight deals and enjoy the best of the cheap flights to Valdez. Valdez is a small town referred to as “Little Switzerland,” owing to its captivating beauty. It is nestled in a glacier ford, known as the Port of Valdez and is surrounded by breathtaking mountain peaks. With a modest population of 4,200 residents, Valdez is dubbed as a self-sustained town with grocery shops, museums, hotels, restaurants, schools, gas stations, a hospital and an airport. This Prince William Sound town gives the adventure enthusiasts a number of reasons to grab some low-flights to Valdez offering plenty of activities to indulge in such as hiking, river rafting, glacier cruises, snowboarding, heli- skiing, kite skiing, cross –country skiing, snowcat skiing, ice climbing, kayaking, snow machining, fishing, etc. There are a few outdoor stores where you can find all the outdoor equipments needed. There are a number of tours available which cover various adventure activities as well. Art and history buffs will also have a great time as the town boasts of a number of world-class museums owing to the black gold that passes through the pipeline. Valdez Museum – Valdez Museum is the perfect spot to learn about the heritage of the town. Located in the heart of the city, the archives of the museum feature various pieces of artworks, relics and artifacts that showcase the history of Valdez. In the annex building, visitors can learn about the 1964 earthquake that caused sizeable destruction in various parts of the town. It displays the efforts made by the locals and the impact the calamity left on the town. There are numerous exhibits showcasing Valdez’s rich history on the gold route. Many artifacts are also dedicated to the catastrophic oil spill and its effects on the area. Denali National Park – Spanning across 6 million acres, Denali national Park boasts of a distinctive solitude, wilderness and tranquility. The energy in the ambience of the park is nothing less than soothing. The wildlife lovers will also have a great time as the beautiful park is home a number of species of fauna. One can even hop on a bus tour considered ideal for a perfect experience of wildlife watching. One can find many animals wandering around the park in their natural habitat in comfort. Overnight camping is also permitted in the park. The camping areas are quite simple and serene. 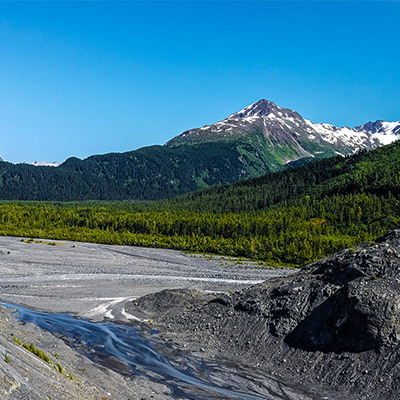 Chugach Mountains – The Chugach Mountains are known for the picturesque snow-capped mountain peaks and the beautiful snow fields, making it the perfect place to get going. The highest point in the mountains is the Mount Marcus Baker located at an elevation of over 13,000 feet. Chugach is said to receive more snowfall than any other place in the world making it an ideal destination for hiking, adventure trails and winter sports. The site also plays host to the world-famous World Extreme Skiing Championship, when the weather is ideal. Activities like skiing, heli-skiing and snowboarding in offerings gives the adventure buffs the perfect reason to grab some cheap airline tickets to Valdez. Keystone Canyon – Taking a stroll around the scenic Keystone Canyon is arguably one of the best ways to pamper your sweetheart. The canyon boasts of several waterfalls, glacier-fed rivers and sheer rock cliffs that make for a very relaxing and scenic experience. You can literally spend an entire day just roaming around the site savoring the beauty surrounding you. One of the highlights of the area is the Horsetail Falls. The water is snow-fed, clear and tranquil. As the water flows down from the top, the waterfall greatly resembles a horsetail, simply breathtaking. Fielding Lake State Recreation Area – Resting at an elevation of nearly 3,000 feet in the Alaska Range, Fielding Lake State Recreational Area is a beautiful campground consisting of 17 sites, a boat launch and restrooms along with a public use cabin. The boat launch provides for some great fishing opportunities. Species like burbot, lake trout and arctic grayling can be found in the lake. It is considered as one of the best places in Alaska for camping. The night time provides for some beautiful star watching. Tourist also make campfire happen and with the dry wood provided, the food is just delicious. At Lookupfare, you can find an extensive range of offers on flight deals. Check out our exclusive deals and offers and grab the best cheap domestic flights.